Canadian Dairy Network Chair Norm McNaughton, CanWest DHI Chair Ed Friesen and Valacta Chair Pierre Lampron. 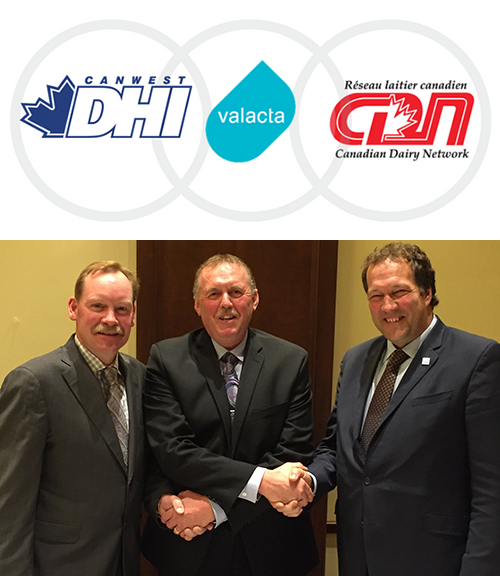 Guelph, Ontario & Ste-Anne-de-Bellevue, Quebec -- CanWest DHI, Canadian Dairy Network and Valacta are pleased to announce an agreement in principle for a progressive new partnership in the dairy industry. The three industry partners are planning a transition that would lead to a unified market presence and joint management of producer services over the coming year. The new partnership will be governed by a producer-driven governance structure to be finalized and approved by members and owners. “We have worked closely with our partners at CanWest DHI and the Canadian Dairy Network for more than two decades and this is a natural extension of our historic working relationship” announced Valacta Chair Pierre Lampron. The new partnership would bring together the leading dairy herd improvement organizations responsible for milk recording and genetic evaluations in Canada with the knowledge transfer activities of the Valacta Centre of Expertise. The new partnership would continue to operate from their primary business locations in Guelph, Ontario and Ste-Anne-de-Bellevue, Quebec. The combined organizations will bring together a team of more than 500 people dedicated to providing services to the more than 11,000 dairy farms across the country. Canadian Dairy Network Chair Norm McNaughton echoed Mr. Lampron’s comments by stating “This is an important milestone in the evolution of our industry. We are demonstrating that not only can we work together across the country, we can also work together across different areas of our industry”. In addition to the two main office locations (CanWest and Canadian Dairy Network are located in the same Guelph building) the new partnership would continue to manage four lab operations (Quebec, Ontario, Alberta and British Columbia). In addition to milk recording and genetic evaluation services, the partners would continue their responsibilities for the analysis of raw milk payment and milk quality services for Dairy Farmers of Quebec, SaskMilk, Alberta Milk and the BC Milk Marketing Board as well as specialized milk analysis services. These lab services will be in addition to the 6 million individual cow samples collected and tested annually by the partners. The combined organizations will leverage their respective strengths to more fully integrate herd management and genetic/genomic information and knowledge transfer for dairy farmers. The ability to combine these key elements of profitable dairy herd management services will provide Canadian dairy farmers with the tools necessary to ensure our global leadership position both for efficient milk production and dairy cattle genetics. CanWest DHI, Canadian Dairy Network and Valacta are farmer-run organizations providing profitable dairy management and genetic solutions to dairy producers across Canada.